Objective Increasing numbers of outbreaks caused by contaminated duodenoscopes used for Endoscopic Retrograde Cholangiopancreatography (ERCP) procedures have been reported, some with fatal outcomes. We conducted a nationwide cross-sectional study to determine the prevalence of bacterial contamination of reprocessed duodenoscopes in The Netherlands. Design All 73 Dutch ERCP centres were invited to sample ≥2 duodenoscopes using centrally distributed kits according to uniform sampling methods, explained by video instructions. Depending on duodenoscope type, four to six sites were sampled and centrally cultured. Contamination was defined as (1) any microorganism with ≥20 colony forming units (CFU)/20 mL (AM20) and (2) presence of microorganisms with gastrointestinal or oral origin, independent of CFU count (MGO). Results Sixty-seven out of 73 centres (92%) sampled 745 sites of 155 duodenoscopes. Ten different duodenoscope types from three distinct manufacturers were sampled including 69 (46%) Olympus TJF-Q180V, 43 (29%) Olympus TJF-160VR, 11 (7%) Pentax ED34-i10T, 8 (5%) Pentax ED-3490TK and 5 (3%) Fujifilm ED-530XT8. Thirty-three (22%) duodenoscopes from 26 (39%) centres were contaminated (AM20). On 23 (15%) duodenoscopes MGO were detected, including Enterobacter cloacae, Escherichia coli, Klebsiella pneumonia and yeasts. For both definitions, contamination was not duodenoscope type dependent (p values: 0.20 and higher). Conclusion In 39% of all Dutch ERCP centres, at least one AM20-contaminated patient-ready duodenoscope was identified. Fifteen per cent of the duodenoscopes harboured MGO, indicating residual organic material of previous patients, that is, failing of disinfection. These results suggest that the present reprocessing and process control procedures are not adequate and safe. In the light of current outbreaks of multidrug-resistant organisms caused by contaminated duodenoscopes, understanding to what extent duodenoscopes are inadequately reprocessed is crucial. Despite current reprocessing procedures, contamination of duodenoscopes continues to occur on a large scale worldwide. Several studies assessed contamination of duodenoscopes with varying outcomes. However, it is unclear what the true burden on a national level is. This cross-sectional study showed high prevalence rates of duodenoscope contamination in Endoscopic Retrograde Cholangiopancreatography (ERCP) centres in the Netherlands. In a substantial proportion of the cultured duodenoscopes, organic material of previous patients was still present, as they were contaminated with microorganisms of gastrointestinal or oral origin. These results suggest that the current combination of reprocessing and process control does not suffice. In this study, contamination occurred with all types of duodenoscopes, independent of type specific design. Patients undergoing ERCP procedures remain to be at risk of being treated with contaminated equipment. Efficient surveillance strategies and reprocessing control measures are required to reduce the number of contaminated duodenoscopes, minimising the chance of interpatient transmission of microorganisms. In the Netherlands, as in many other parts of the world, process control is used. This means that reprocessing is considered to be adequate when it is performed according to the IFU and according to the standard handbook of the Dutch Steering Group for Flexible Endoscope Cleaning and Disinfection (SFERD).12 This handbook is based on regulations applicable in the Netherlands as well as the guidelines of the European Society of Gastrointestinal Endoscopy (ESGE).13 Despite international outbreaks and outbreaks in Dutch ERCP centres,14 15 both the IFU and SFERD do not include microbial surveillance after disinfection as a routine practice. Recently, contamination of duodenoscopes has been assessed in several studies.16–18 Most studies were performed in a single university centre,16 18 making it difficult to extrapolate their results and estimate the true burden on a national level. A study among 21 centres was conducted by Brandabur et al,17 showing contamination rates with a wide variability across centres. To date, no such study has been conducted in a nationwide setting using a uniform sampling and culture method as well as examining all possible contamination sites. Given the increase in the number of publications pertaining duodenoscope contamination and the potentially severe consequences for patients, there is an urgency to develop a more thorough understanding of the scale of the problem. 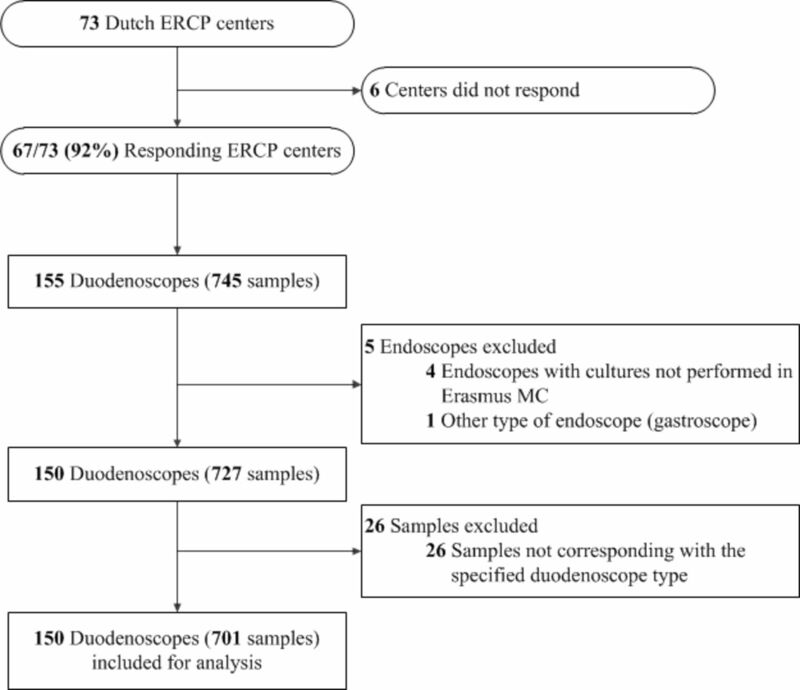 Therefore, the aim of this study was to determine the prevalence of microbial contamination of patient-ready duodenoscopes in all ERCP centres in the Netherlands. We conducted a prospective nationwide cross-sectional study among all Dutch ERCP centres. In the Netherlands, over 16.000 ERCP procedures are performed in 73 ERCP centres yearly.19 All 73 Dutch ERCP centres were asked to sample at least two duodenoscopes at their own choosing and, if present, to include the newest Olympus TJF-Q180V (Olympus, Zoeterwoude, The Netherlands). Duodenoscopes were eligible for sampling if they were reprocessed and ready for patient use, for example, after high level disinfection or after drying in the storage cabinet. No data were recorded about the moment of sampling, surveillance methods or adherence to reprocessing or sampling protocols. No patient data were included in this study; therefore, there was no need for approval by the Medical Ethical Research Committee. Sampling was performed independently by local staff of the included ERCP centres, using a centrally distributed sample collection kit, according to a strict and uniform sampling protocol (see online supplementary files). This method was developed by a multidisciplinary team of reprocessing staff, medical device experts, infection control professionals, medical microbiologists and gastroenterologists based on the SFERD standard handbook.12 The sampling protocol was explained using 12 instruction videos available online (see online supplementary videos). As examples, the sampling and labelling procedure was shown in detail using one Olympus TJF-160VR and one Pentax ED34-i10T (Pentax, Dodewaard, The Netherlands) duodenoscope. Duodenoscopes were sampled while placed in the Automated Endoscope Reprocessor or on a sterile surface. Depending on the duodenoscopes type, four to six sites were sampled. The four sites present in all duodenoscope types were: (1) a flush of the biopsy channel, (2) a flush of the suction channel, (3) a swab from the forceps elevator and (4) a single brush through the biopsy and suction channel. Type-dependent samples were: (1) a swab of the removable protection cap and (2) a flush of the elevator channel or air/water channel, if these channels were unsealed. Channels were flushed with sterile physiological saline solution of which at least 20 mL was collected at the distal tip in a sterile container. The flush fluid was aspirated with a sterile needle and injected in two 9.5 mL BD Vacutainers without additives (Becton Dickinson, Etten-Leur, The Netherlands). Forceps elevator and protection cap were sampled with ESwabs (Copan Italia S.p.A., Brescia, Italy). Type dependent, Olympus BW-412T or Pentax CS6021T single-use endoscope cleaning brushes were used to brush the biopsy and suction channel. Both ESwabs and the brush tip were transported in ESwab medium. Instructions were to swab first, second to flush the channels and finally to brush the channels. The decision to reprocess the endoscope after sampling was up to the respective centres and was not documented for the purpose of the current study. Samples were sent to the Erasmus MC department of Medical Microbiology and Infectious Diseases for culturing. Samples were cultured on the day of receipt. Channel flushes were filtrated over a 0.45 µm filter of which the filtrate was forced on R2A agar. ESwabs and brush tips were vortexed in their ESwab medium of which 0.75 mL was poured on a blood agar. Samples were incubated at 35°C, examined for growth for 72 hours and read at 24 hours, 48 hours and 72 hours. Culture results were presented in colony forming units (CFU)/20 mL per microorganism. Results were sent to the respective ERCP centres without further interpretation: further action was up to the respective ERCP centre and was not documented for the purpose of the current study. At the time of study conduct, Dutch guidelines for endoscopy centres stated that in case of contamination with a subset of indicator microorganisms with ≥20 CFU/20 mL or in case of persistent contamination, endoscopes should be quarantined and possible causes be investigated.12 Cultured microorganisms were categorised depending on their origin into gastrointestinal, oral, skin and waterborne flora. Contamination was defined according to two definitions: (1) microbial growth with ≥20 CFU/20 mL of any type of microorganism (AM20) as used by the ESGE guideline and Dutch SFERD handbook12 13 or (2) presence of microbial growth (≥1 CFU/20 mL) of gastrointestinal and/or oral microorganisms (MGO). Categorical data are presented in percentages. Mean (range) and median (IQR) are given for continuous and skewed data, respectively. The χ² test was used to compare categorical data and Student’s t-test or Mann Whitney U-test was used to compare continuous data. Contamination rates of duodenoscope types and sample sites were compared according to a logistic regression model, using the SAS procedure GENMOD. This model adjusted for the multiple samples of each unique duodenoscope, with each duodenoscope clustered within their respective ERCP centre. Duodenoscope types were compared with the newest Olympus TJF-Q180V type as a reference and sample sites were compared with the flush of the biopsy channel. For both analyses, duodenoscope types or sample sites could be included if there was at least one contamination case and one non-contamination case. Analyses were performed using SAS V.9.4 (SAS, Cary, North Carolina, USA) and SPSS V.21.0 (IBM, Armonk, New York, USA). Between June 2015 and March 2016, 67 out of 73 (92%) Dutch ERCP centres sampled 745 sites of 155 endoscopes. Five endoscopes were excluded: four duodenoscopes from one centre whose samples were cultured in their own microbiology department and one gastroscope from another centre as this type of endoscope does not have a forceps elevator, that is, no duodenoscope (figure 1). Twenty-six samples from 17 duodenoscopes were excluded, as these sites did not correspond with the specified duodenoscope type. This resulted in an inclusion of 150 duodenoscopes with a total of 701 samples from 66 (92% of all centres) ERCP centres (figure 1). The median time between local sampling and culturing in the Erasmus MC was 1 day (IQR 1–2). Table 1 provides an overview of the contamination prevalence per duodenoscope type and sample site for AM20 and MGO contamination definitions. Contamination according to the AM20 definition was found in 33 (22%) out of the 150 reprocessed and patient-ready duodenoscopes. Duodenoscopes were most often contaminated with skin flora (n=17; 11%) and to a lesser extent with waterborne flora (n=12; 8%), gastrointestinal flora (n=10; 7%) or oral flora (n=4; 3%). Contamination according to the MGO definition was found in 23 (15%) duodenoscopes. Table 2 shows all different microorganisms that were cultured, among others Escherichia coli, Klebsiella pneumoniae and Pseudomonas aeruginosa. Flow diagram. ERCP, Endoscopic Retrograde Cholangiopancreatography. Ten different duodenoscope types from three distinct manufacturers (ie, Olympus, Pentax and Fujifilm) were sampled. Contamination as defined by AM20 was identified in five different duodenoscope types and contamination as defined by MGO was identified in four different types. As shown in figure 2, contamination for AM20 (four duodenoscope types included) as well as MGO (two duodenoscope types included) was shown not to be type-dependent (all p>0.05). OR for each duodenoscope type on contamination. AM20, microbial growth with ≥20 CFU/20 mL of any type of microorganism; CFU, colony forming units; MGO, presence of any microbial growth of gastrointestinal or oral microorganisms. The AM20 contaminated duodenoscopes originated from 26 (39%) centres across the Netherlands. 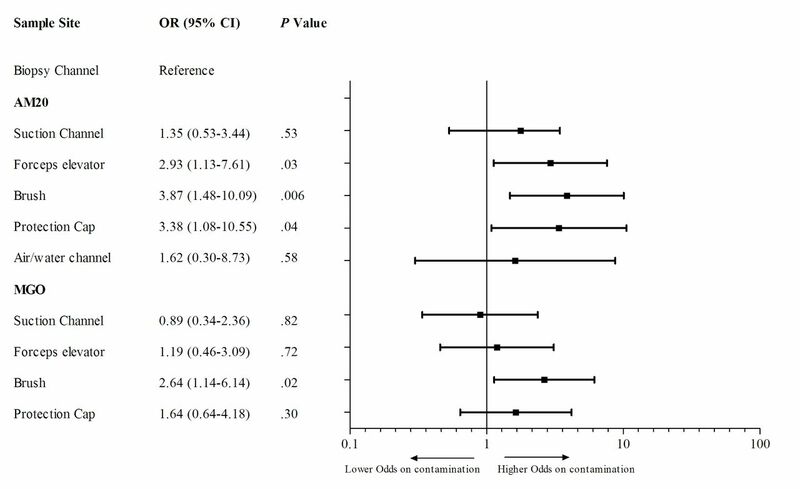 No difference (p=0.10) was shown in contamination prevalence between academic tertiary medical centres (n=3/8; 38%), specialised peripheral medical centres (n=13/23; 57%) or general peripheral medical centres (n=10/35; 29%). This was also the case for MGO-contaminated duodenoscopes originating from 19 (28%) centres. No difference was found (p=0.25) between academic tertiary medical centres (n=3/8; 38%), specialised peripheral medical centres (n=9/23; 39%) and general peripheral medical centres (n=7/35; 20%). Microorganisms were cultured from 166 (24%) sample sites of 97 (65%) duodenoscopes. Additionally, 54 (8%) sample sites of 41 (27%) duodenoscopes contained two or more microorganisms, in some cases up to five different microorganisms. As shown in table 1, all sample sites, except the flush of the elevator channel, were found positive for AM20 or MGO contamination. The flush of the biopsy channel was used as a reference to compare the contamination prevalence of all sample sites. Three sample sites had a higher probability of being contaminated (figure 3). According to the AM20 definition, the swab of the elevator (OR 2.93, 95% CI 1.13 to 7.61; p=0.03) and the swab of the protection cap (3.38, 95% CI 1.08 to 10.55; p=0.04) were more often contaminated. The brush of the biopsy/suction channel was more often contaminated for both AM20 (OR 3.87, 95% CI 1.13 to 7.61; p=0.006) and MGO (OR 2.64, 95% CI 1.14 to 6.14; p=0.02) definitions. OR for each sample site on contamination. AM20, microbial growth with ≥20 CFU/20 mL of any type of microorganism; CFU, colony forming units; MGO, presence of any microbial growth of gastrointestinal or oral microorganisms. In our nationwide prevalence study, we found that over one-fifth of sampled duodenoscopes were contaminated according to AM20 definition, with 39% of Dutch ERCP centres having at least one contaminated duodenoscope intended to be ready for patient use. Furthermore, MGO were cultured on 15% of the sampled duodenoscopes, indicating the presence of organic residue of previously treated patients. Our observations coincide with worldwide reported outbreaks indicating that exogenous transmission of bacteria and associated infections and even viral infections related to contaminated duodenoscopes continue to threaten patients undergoing ERCP.1–4 20 Therefore, stringent measures are required to lower the number of contaminated duodenoscopes in order to minimise the risk of interpatient microbial transmission during ERCP and to prevent future outbreaks. The most recent duodenoscope types introduced into the market have distinct design changes, including sealing of the elevator channel and a sealed protection cap, aimed at preventing contamination and the need for reprocessing at these locations. In 2012, an outbreak in our hospital was linked to the newest Olympus TJF-Q180V duodenoscope.2 After the outbreak, the duodenoscope was investigated by Olympus and an independent expert. One of the conclusions was that TJF-Q180V’s specific design features hampered adequate cleaning and disinfection.15 To further investigate these matters, we asked participating centres to include the TJF-Q180V duodenoscope, if present. The current study shows that contamination for both AM20 and MGO were not restricted to certain duodenoscope types. This is in line with outbreaks that have been reported involving various duodenoscope types from all three manufacturers.6 Moreover, Brandabur et al also reported that culture positivity was not affected by scope type.17 Despite differences in design, none of the available duodenoscope types seem excluded from the risk of contamination. The differences in the type of cultured flora can give an indication where in the reprocessing process the duodenoscopes were contaminated. Several guidelines that advocate active microbiological surveillance give guidance on how to interpret culture results.13 25 In this study, a substantial number of duodenoscopes were contaminated with skin and waterborne flora. Contamination with skin flora is thought to arise from handling and therefore could potentially easily be reduced by improved handling during reprocessing and transport. However, the presence of skin flora could be due to contamination during sampling. We cannot rule out this cause as sampling on site was not audited. Dutch centres have to use filtered water for reprocessing facilities and process control involves quarterly microbiological control of the rinse water.12 In our view, persistent contamination with waterborne flora demands a thorough investigation as it can be caused by several factors, including contamination of the water supply, inadequate filtering of the water supply and inadequate drying of the endoscope during storage. Contamination with MGO indicates inadequate reprocessing as originating from the gastrointestinal tract. This type of contamination could be due to a breach in the reprocessing procedure or because the reprocessing procedure cannot be adequately performed due to reprocessing, endoscopic or procedure specific risk factors. Currently, we are working on a Dutch guideline in which actions following positive cultures will be described extensively. The guideline will be submitted for international publication in the near future. Differences in Automated Endoscope Reprocessors, endoscope hang time and different reprocessing methods do not seem to affect contamination rates.17 26 27 Beside the complex design of the duodenoscope,2 6 28 endoscope age has also been suggested as a risk factor,2 18 26 with Brandabur et al proposing the number of procedures as a better indicator for endoscope usage.17 Contamination does not seem to be confined to duodenoscopes: single-centre studies show that coloscopes and gastroscopes can have similar contamination rates.18 22 However, compared with duodenoscopes, other gastrointestinal endoscopes are far less the reason of recent reported outbreaks.5 We hypothesise that this could be due to differences between types of procedures as ERCP procedures tend to be more invasive, entering sterile body cavities and could have a more compromised patient population. The latter defines the more serious and therefore detectable clinical outcome of transmission of microorganisms by ERCP compared with other gastrointestinal endoscopes. In current guidelines and studies, there is no international consensus on a uniform sampling and culturing method, although several differences could potentially affect culture outcomes. The location and the number of sample sites differ greatly: in some instances, a channel brush18 31 or swab of the forceps elevator12 24 is omitted. When the channel brush or the forceps elevator would not be cultured in the present series, 19% (6/32) or 9% (3/32), respectively, of the AM20 contaminated duodenoscopes would have been missed. Some studies and guidelines advocate a different order of sampling, such as retrograde sampling or the flush-brush-flush method, as it might have a higher sensitivity.14 25 31 32 The cleaning brush that is used for sampling could disrupt present biofilms and affect subsequent samples. However, in this study, the brush sample was performed last. A sample flush with a neutraliser instead of saline solution can prevent false negative outcomes due to the biocidal activity of residual disinfectants33 34 and is advocated by the French guideline and several French studies.18 21 33 35 The toxicity of the neutralisers might also cause false negatives,36 and theoretically the endoscope should not contain any residual disinfectant after a successful reprocessing cycle. Other guidelines including the Dutch guideline, according to which our sampling protocol was designed, do not require a neutraliser based on current evidence.12 13 25 31 However, if a neutraliser effectively prevents false negative outcomes, the contamination rates in this study could be even higher. A longer incubation time is associated with a higher culture positivity rate. Saliou et al state that endoscope samples should be incubated for at least 1 week. In their study, after 48 hours only 55.5% of the final number of contaminated endoscopes were found positive.18 Some studies and guidelines use an incubation time of 48 hours.16 17 25 31 In this study, we have chosen for a 72 hours period: the microorganisms of concern would be detected and the study results could by compared with the centres’ previous microbiological surveillance results. Also, the choice of growing media for incubation of flush samples can affect the culture positivity rate. R2A agar, as used in this study, has a high sensitivity, especially for slower growing microorganisms.37 38 To be able to compare test results and omit false negative test results, standardised and uniform instructions for sampling, culturing and interpretation of culture results should be devised which, based on results in this study, should include a channel brush and a swab of the forceps elevator as these sites pose the highest risk of contamination. To the best of our best knowledge, this is the first study assessing contamination of duodenoscopes nationwide. Another strength of our study is that we cultured all samples in one microbiology laboratory using a standardised protocol. Finally, because of the extensive sampling method we were able to analyse all possible contamination sites. This study has some limitations. This study could only be conducted nationwide as a cross-sectional study without follow-up samples of the duodenoscopes: improvement of contamination rates or persistent contamination was not assessed. Furthermore, sampling was conducted independently by local staff. Although we provided strict sampling protocols with clear video instructions on how the culture procedure should be performed, we were not able to check for adherence to the sampling protocol. Also the conditions in which the endoscopes were sampled (ie, just disinfected or after drying with or without alcohol flush or positive air flow) were not recorded. Potential differences in culture outcomes between sampling post-disinfection or postdrying, differences in drying times or other storage or reprocessing parameters could not be assessed. However, all assessed duodenoscopes were ready for use in patients and should not be contaminated, regardless of the moment of reprocessing. We hypothesise that the effect of these factors on the presence of especially gastrointestinal and or oral flora is rather small, as we see this as a failure of the reprocessing process. Last, a small amount of sites were not sampled, which could cause underestimation of the total number of contaminated duodenoscopes. The observed nationwide high prevalence of contamination of patient-ready duodenoscopes is a clear indication that the current combination of reprocessing and process control is not sufficient. All participating hospitals are dedicated endoscopy centres following the national guideline that underlines process control. This includes reprocessing exactly according to the manufacturer’s instructions and extensive yearly audits.12 23 As adherence to reprocessing protocols was not observed, this study shows real-life outcomes of patient-ready duodenoscopes with little bias. Regardless of whether the precise cause of contamination was a breach in the reprocessing process or the complex duodenoscope design, process control was not able to identify and prevent such large-scale inadequate reprocessing. This calls for concerted action by all parties involved, that is,: manufacturers, regulatory bodies, government agencies, gastroenterologists and medical microbiologists. Nowadays, ERCP has evolved into a minimally invasive interventional procedure having replaced more invasive and complicated surgical procedures. It is an essential procedure practiced all over the world with over 650 000 procedures performed in USA annually.39 During revision of the market clearance of the Olympus TJF-Q180V duodenoscope, the U.S. Food and Drug Administration (FDA) stated that a decrease in ERCP capacity would be unacceptable.40 However, contaminated duodenoscopes put patients at risk of developing clinically relevant infections by transmission of microorganisms. In 2015, the FDA issued a warning that some parts of duodenoscopes may be extremely difficult to access and adequate cleaning of all areas may not be possible.28 Since then additional measures have been suggested,11 including alternative reprocessing methods or implementation of microbial surveillance as proposed by Centres for Disease Control and Prevention.10 31 Eventually, radical changes in the design of duodenoscopes should ensure thorough cleaning and disinfection. However, development and market introduction of such newly designed duodenoscopes will require substantial time. A complicating factor is that standardised procedures to test duodenoscopes in their ability to be adequately cleaned and disinfected are not available. Therefore, on the short term, we should not solely rely on process control as there is no scientific proof that this serves as a reliable proxy for safe and clean duodenoscopes. Uniform guidelines and instructions for microbial surveillance should be developed. Also, an international registry for contaminated scopes should be instituted in order to truly estimate the scale of the problem and track its impact and revolution over time. To conclude, this nationwide cross-sectional study shows high prevalence rates of contamination of duodenoscopes in Dutch ERCP centres. The recent reports on infections due to contaminated endoscopes will probably be due to involvement and alertness on highly resistant microorganisms, but also the more and more complex designs of endoscopes can play a role in this emergence. Additional preventive measures including microbial surveillance strategies are needed to reduce the number of contaminated duodenoscopes. The authors would like to thank the reprocessing staff, medical devices experts, infection control professionals, medical microbiologists and gastroenterologists at the following Dutch ERCP centres for their participation and effort for this study: Academic Medical Center (AMC), Amsterdam; Albert Schweitzer Hospital, Dordrecht; Alrijne Hospital, Leiden/Leiderdorp; Amphia Hospital, Breda; Antoni van Leeuwenhoek, Amsterdam; Antonius Zorggroep, Sneek; Beatrix Hospital, Gorinchem; Bernhoven, Uden; Bravis Hospital, Roosendaal; Canisius Wilhelmina Hospital, Nijmegen; Catharina Hospital Eindhoven, Eindhoven; Deventer Hospital, Deventer; Diakonessenhuis, Utrecht; Elkerliek Hospital, Helmond; Erasmus University Medical Center (Erasmus MC), Rotterdam; FlevoHospital, Almere; Groene Hart Hospital, Gouda; Hospital Amstelland, Amstelveen; Hospital De Tjongerschans, Heerenveen; Hospital Gelderse Vallei, Ede; Hospital St. Jansdal, Harderwijk; IJsselland Hospital, Capelle aan Den IJssel; Ikazia, Rotterdam; Isala Diaconessenhuis, Meppel; Jeroen Bosch Hospital, ’s Hertogenbosch; Laurentius Hospital, Roermond; Leiden University Medical Center (LUMC), Leiden; Maasstad Hospital, Rotterdam; Maastricht University Medical Center (MUMC), Maastricht; Martini Hospital, Groningen; Maxima Medical Center, Veldhoven; Meander Medical Center, Amersfoort; Medical Center Alkmaar, Alkmaar; Medical Center Haaglanden, Den Haag; Medical Center Leeuwarden, Leeuwarden; Medical Center Slotervaart, Amsterdam; Medical Center Zuiderzee, Lelystad; Medisch Spectrum Twente, Enschede; Nij Smellinghe Hospital, Drachten; Ommelander Hospital Group, Delfzijl; Onze Lieve Vrouwe Gasthuis—Location East/West, Amsterdam; Radboud University Medical Center (Radboudumc), Nijmegen; Reinier de Graaf Hospital, Delft; Rijnstate Hospital, Arnhem; Rode Kruis Hospital, Beverwijk; Slingeland Hospital, Doetinchem; St. Anna Hospital, Eindhoven; St. Antonius Hospital, Nieuwegein; St. Elisabeth Hospital, Tilburg; St. Franciscus Gasthuis, Rotterdam; Tergooi Hospital, Hilversum; Treant Zorggroep, Location Scheper, Emmen; TweeSteden Hospital, Tilburg/Waalwijk; University Medical Center Groningen (UMCG), Groningen; University Medical Center Utrecht (UMCU), Utrecht; VieCuri Medical Center, Venlo; VU Medical Center, Amsterdam; Westfriesgasthuis, Hoorn; Wilhelmina Hospital Assen, Assen; Zaans Medical Center, Zaandam; Ziekenhuisgroep Twente, Almelo; ZorgSaam Hospital, Terneuzen; Zuwe Hofpoort Hospital, Woerden; Zuyderland Medical Center, Heerlen. . . , . (). United States Senate. Preventable Tragedies: superbugs and how ineffective monitoring of medical device safety fails patients. Washington, United States: United States Senate, 2016. https://www.help.senate.gov/imo/media/doc/Duodenoscope_Investigation_FINAL_Report.pdf (accessed 13 Jan 2016). Advisory Board Cleaning and Disinfection Flexible Endoscopes (SFERD). Professional standard handbook. Flexible endoscopes - Cleaning and disinfection, 2016. https://www.infectiepreventieopleidingen.nl/kennisbank/kennisbank/sferd-handboek-4-0 (accessed 1 Sep 2016).
. Investigational report on a TJF-Q180V duodenoscope following contamination after cleaning and disinfection. Available on request from the Dutch Healthcare Inspectorate/National Institute for Public Health and the Environment. Bilthoven, The Netherlands, 2012.
. [Hepatitis C after retrograde cholangiography]. Gastroenterol Clin Biol 1993;17:763–4. Working party on infection prevention (WIP). Heat-sensitive flexible endoscopes. Leiden, the Netherlands, 2015. http://www.rivm.nl/dsresource?objectid=4c1522b5-9aa2-4a3e-b812-4e08abace739&type=org&disposition=inline (accessed 1 Jan 2016). Gastroenterological Society of Australia / Gastroenterological Nurses College of Australia. Infection control in endoscopy. Mulgrave, Australia: Gastroenterological Society of Australia, 2010. http://cart.gesa.org.au/membes/files/Clinical_Guidelines_and_Updates/Infection_Control_in_Endoscopy_Guidelines_2014.pdf (accessed 13 Jan 2016). US Food and Drug Administration (FDA). Design of Endoscopic Retrograde Cholangiopancreatography (ERCP) Duodenoscopes May Impede Effective Cleaning: FDA Safety Communication. USA, 2015. http://wayback.archive-it.org/7993/20170722213105/https://www.fda.gov/MedicalDevices/Safety/AlertsandNotices/ucm434871.htm (Updated 4 Mar 2015). Centers for Disease Control and Prevention. Interim protocol for healthcare facilities regarding surveillance for bacterial contamination of duodenoscopes after reprocessing. Atlanta, United States, 2015. https://www.cdc.gov/hai/pdfs/cre/interim-duodenoscope-surveillance-protocol.pdf (accessed 19 Aug 2015).
. Validation of microbial recovery from disinfectants. PDA J Pharm Sci Technol 2002;56:255–66. US Food and Drug Administration (FDA). Executive summary: effective reprocessing of endoscopes used in Endoscopic Retrograde Cholangiopancreatography (ERCP) Procedures. USA, 2015. www.fda.gov/downloads/advisorycommittees/committeesmeetingmaterials/medicaldevices/medicaldevicesadvisorycommittee/gastroenterology-urologydevicespanel/ucm445592.pdf (accessed 14 May 2015). US Food and Drug Administration (FDA). Updated information for healthcare providers regarding duodenoscopes. USA, 2015. www.fda.gov/downloads/MedicalDevices/DeviceRegulationandGuidance/ReprocessingofReusableMedicalDevices/UCM436588.pdf (accessed 4 Mar 2015). MJB and MCV contributed equally. Contributors AWR: acquisition of data; analysis and interpretation of data; drafting of the manuscript; critical revision of the manuscript for important intellectual content; statistical analysis. AFV in ‘t holt: analysis and interpretation of data; critical revision of the manuscript for important intellectual content; statistical analysis. JGB: study concept and design; critical revision of the manuscript for important intellectual content. RDG: study concept and design; acquisition of data; critical revision of the manuscript for important intellectual content. BEH: analysis and interpretation of data; critical revision of the manuscript for important intellectual content; statistical analysis. MJB: study concept and design; analysis and interpretation of data; critical revision of the manuscript for important intellectual content; study supervision. MCV: study concept and design; analysis and interpretation of data; critical revision of the manuscript for important intellectual content; obtained funding; study supervision. Funding This study was supported by grant 324841 from the Dutch Ministry of Health, Wellbeing and Sports (Professor Dr MCV). Disclaimer The funder of the study had no role in study design, data collection, data analysis, data interpretation or writing of the report. Competing interests AWR, AFV in ‘t holt, JGB and RDG reported no relevant financial activities. BEH has had the following relevant financial activities outside the submitted work: Consultant for Intercept Pharmaceuticals Inc.; Consultant for Novartis; Consultant for Albiero; Received grants from Intercept Pharmaceuticals Inc.; Received grants from Roche International. MJB has had the following relevant financial activities outside the submitted work: Consultant for 3M; Grant from 3M for an investigator initiated study for the benefit of the Department of Gastroenterology and Hepatology, Erasmus MC University Medical Center, Rotterdam, The Netherlands; Consultant and lecturer for Boston Scientific; Grants from Boston Scientific for investigator initiated studies and industry initiated studies for the benefit of the Department of Gastroenterology and Hepatology, Erasmus MC University Medical Center, Rotterdam, The Netherlands; Consultant and lecturer for Cook Medical; Grants from Cook Medical for investigator initiated studies and industry initiated studies for the benefit of the Department of Gastroenterology and Hepatology, Erasmus MC University Medical Center, Rotterdam, The Netherlands; Grant of Pentax Medical for the benefit of the Department of Gastroenterology and Hepatology, Erasmus MC University Medical Center, Rotterdam, The Netherlands. MCV has had the following relevant financial activities outside the submitted work: Grant from 3M for an investigator initiated study. Presented at Spring meeting Dutch Society of Gastroenterology. Veldhoven, The Netherlands, 17–18 March 2016. Title: Bacterial contamination of reprocessed ERCP duodenoscopes in The Netherlands is widespread (abstract number: 4317) Oral presentation. Session Title: President Select 26th ECCMID Congress, the European Congress of Clinical Microbiology and Infectious Diseases. Amsterdam, The Netherlands, 9–12 April 2016. Title: ERCP duodenoscopes in Dutch ERCP centres: high prevalence of bacterial contamination despite reprocessing (abstract number: O384) Oral presentation. Session Title: New insights in the control of multi-resistant Gram-negatives Digestive Disease Week. San Diego, USA, 21–24 May 2016. Title: ERCP Duodenoscopes in Dutch ERCP Centres: High Prevalence of Bacterial Contamination Despite Reprocessing (abstract number: 2442341) Oral presentation. Session Title: Bugs on Duodenoscope: Pressing Need for Pest Control (ASGE) 8th Steering Group Flexible Endoscopes Cleaning and Disinfection (SFERD) Symposium, Veenendaal, the Netherlands, 14 September 2016. Title: Contamination of duodenoscopes, where are we now? Oral presentation.